A group of students in India, blessed to receive their own copies of God’s Word. © 2014 The Gideons International. Weeks before Charles Warren arrived in Chennai to lead an international team in India’s International Scripture Blitz (ISB) this January, he began having doubts. Would doors be open for them to share God’s Word? 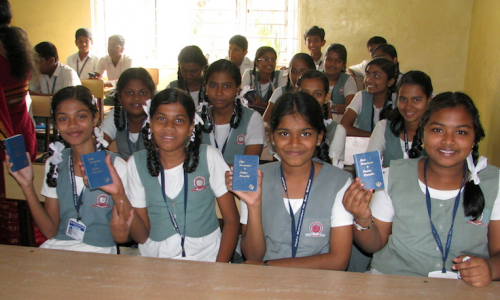 The Gideons International has enjoyed much growth in India. Last year, Gideons there achieved their Scripture goal, providing 13.3 million Scriptures. Warren and the rest of the international team landed in Chennai on Friday, January 17, praying for open doors and safety. 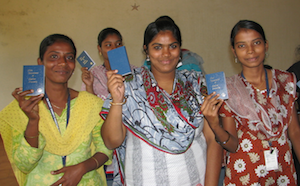 Members in India welcomed them with enthusiasm, as they prepared to provide Chennai with copies of God’s Word. One of the young men in India who received a New Testament from Gideons during the blitz. © 2014 The Gideons International. 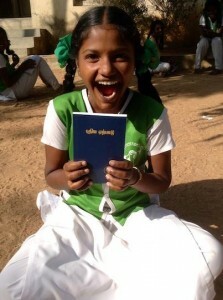 Young students in Chennai display their new copies of God’s Word. © 2014 The Gideons International. As is often the case on an ISB, the majority of distributions during the Chennai blitz took place at schools. However, weeks earlier, there had been resistance. “I was under the impression that many schools would be closed to the Gospel,” shared Warren. Prior to the blitz in Chennai, Gideons and Auxiliary around the world had been praying for open doors. And God answered their prayers, as every school where Gideons requested access allowed them to come in and distribute Scriptures. Surprisingly teams were even able to share the Gospel in classrooms and assemblies. During the six days of distributions and placements, the Gideons and Auxiliary placed and distributed 250,901 Scriptures, exceeding their goal of 200,000. “God honors our prayers,” said Warren. “The people were very open to receiving our gift. I was surprised by how open they were. Over 250,000 people took a copy of God’s Word,” reflected Warren. “If you think about it,” he went on, “that means 250,000 families have a copy of God’s Word going into their homes. That’s powerful.” The team that landed in Chennai, India, praying for open doors and protection left seven days later praising God and claiming the promise that His Word would not return void. Please pray that these ladies in India will read their new copies of God’s Word daily and embrace Jesus as their Lord and Savior. © 2014 The Gideons International. 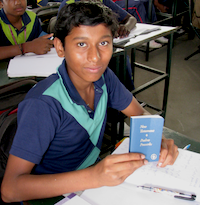 We thank the Gideons and Auxiliary who participated in the 2014 India International Scripture Blitz. We also thank the pastors, donors and others who’ve supported The Gideons International. Your prayers and financial gifts are making a difference. Most of all, we praise God for the Scriptures distributed in Chennai. We give Him all the glory for the lives that will be changed as people read the Scriptures placed there and come to discover the hope found only in Jesus. After reading the story of 2 women who were jailed in India, I am amazed that you were able to distribute and not jailed or worse. God is truly the powerful on able to overcome all difficulties in our lives. I will pray through these scriptures, Jesus will truly make an eternal change in all these people. GOD IS GREAT AND HOLY. Blessings to all these children! Praise The Lord! I was in Chennai last year and I saw how amazingly and strategically Christian brothers are sharing the gospel there. Awsome God! I am more than happy to be a member of this Ministry. Together we can! Go Gideons! God is on charge of our lives!!! Wao, what a great God we serve. That is great! All glory to Mighty God! Inasmuch as ye have done it (brought Gods word with love as for a similar one of your children in the US or non-3rd world) unto the least of these my BRETHREN, ye have done it unto ME (Jesus Christ the LORD of Glory). He said from the cross, It is finished. That was His work not ours.